The following page aims to paint a picture of the experiences of the 319th Squadron, 90th Bomb Group “Asterperious” USAAF at Fenton Field from the 2nd of February to the 8th of July 1943 (USAAF Combat Chronology Documents). It is not intended as a military history or chronology of combat missions flown by the squadron as this topic has received considerable attention in other works such as in Glenn R. Horton and Gary L. Horton’s book entitled “King of the Heavies” (1983) and by B. Alford in his book entitled “Darwin’s Air War 1942-1945″ (2011) to mention only a few. 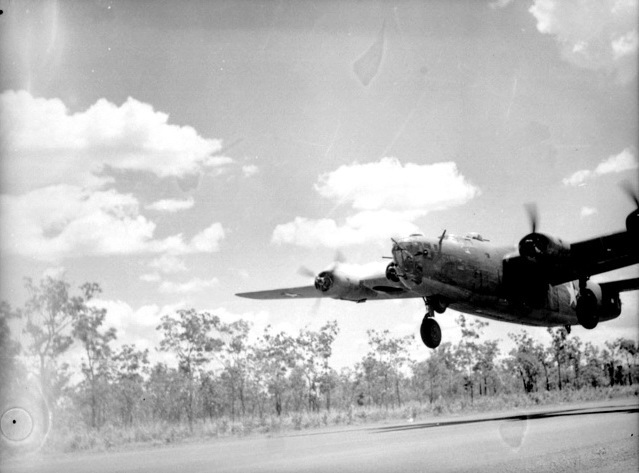 Rather this page aims to focus on the social aspects of the 319th’s occupation of Fenton Field and document the personal experiences of officers and enlisted personnel at the remote and “desolate” airbase some 110 miles south of Darwin. 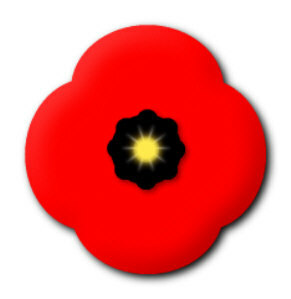 As such, accommodation, food, personal recollections and other activities will be examined throughout this page. Please contact me if you can contribute information to this page. Thanks. Much of the current (15-12-14) information and photos contained within this page comes from a late veteran of the 319th Squadron, T/Sgt Ray W. Smeltzer, who gave me written permission (1999) to use his photos and interview material on my previous website entitled “The Fenton and Long Research page”. Ray was assigned to fly as radio Operator-Gunner of the aircraft “Roarin’ Rosie” a B-24D (41-31698). The author was saddened to learn of Ray’s passing on October 9, 2003 at the age of 83. 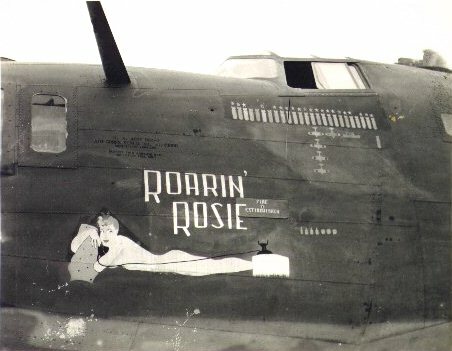 “Roarin’ Rosie” (41-31698). T/Sgt Ray W. Smeltzer’s assigned “ship”. “accommodations and the living conditions left something to be desired…we weren’t too bad off” Smeltzer (1999). Enlisted men’s Recreation Building Fenton Field base camp area, February 1943. It appears this building has a concrete floor and the walls clad with paperbark with a corrugated iron roof. Ray. W. Smeltzer collection (1999). 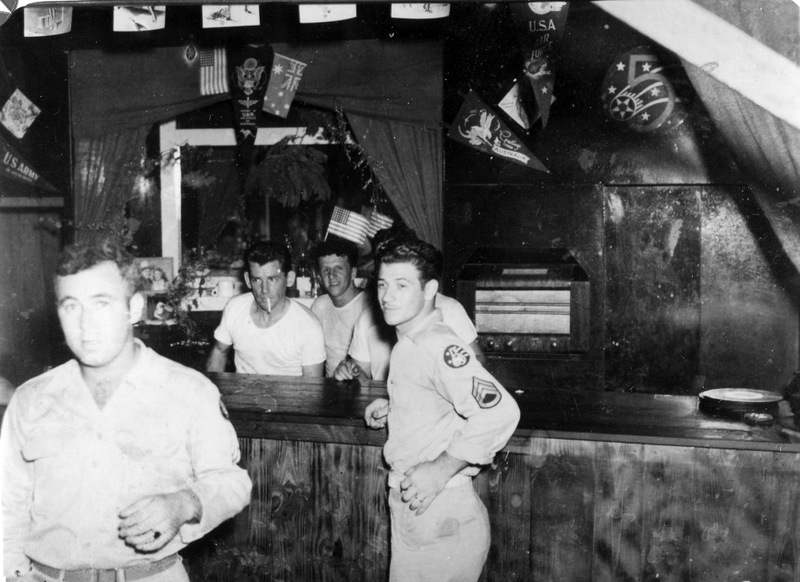 Inside the enlisted mans recreation hut during the 380th Bomb Groups stay at Fenton Field. Ray. W. Smeltzer collection (1999). According to Smeltzer (1999), 6 enlisted men shared this M-1934 Pyramidal Tent pictured above. Officer and enlisted men’s tent lines were pitched in separate locations. The M-1934 provided the bulk of the accommodation facilities at Fenton in early 1943 and was to prove a very important commodity. This particular tent has the canvas sides rolled up to allow the breeze to flow through. As can be seen in this photo, conditions were quite primitive as a lot of the spear grass has not been cleared from the camp area. The tent floor is not sealed and no real attempt has been made to seal the sides of the tent from the weather and insects. 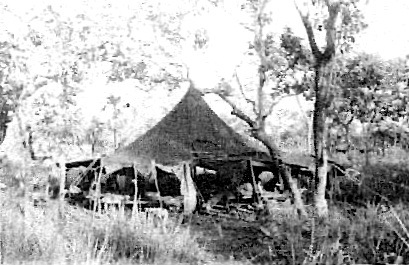 As this photo was taken in February 1943, monsoonal showers would have been commonplace making sleeping conditions inside the tent uncomfortable due to the hot and humid conditions. Between storms, there would have been no breeze to speak of and mosquitoes and march fly’s would have been an ever present source of irritation. The situation as to the standards of living at Fenton however was to improve somewhat with the arrival of the 380th Bomb Group in late April 1943. A chain and plate assembly from an M-1934 type tent as found at 48 Mile camp. The center pole of the tent went through the center of the plate and the chains held up each quadrant of the pyramid structure to form a spindle. “S/Sgt George Rice, Tail Turret Gunner” at the entrance to a M-1934 tent. Smeltzer (1999). Note how the tree has been use to support the apex of the pyramid roof and the guys on the side of the tent. Ray. W. Smeltzer collection (1999). 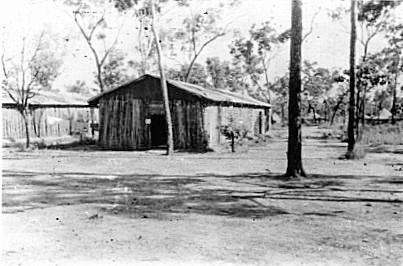 “S/Sgt Newville [the] Medical NCOIC (Non-Commissioned Officer in Charge) doing a little building on his facility” Note the bush timber being used to create a ridged frame around the tent in order to improve its structural rigidity. Ray. W. Smeltzer collection (1999). Other tents were in use during the 319th’s squadrons stay at Fenton such as a the “wall tent” pictured above. The wall tent came in two different sizes, small and large, with the large (pictured above) having an 8 man capacity. It appears that this type of tent was used for medical purposes during the 319th’s stay at Fenton. “The tent was home to the enlisted men of the crew, and was located at the end of the wide street lined with tents which were the living quarters of the Combat Crews. We called it ” Ack Ack Avenue “. Ray continues onto say that “our tents were placed along a dirt street lined with 50 Gal (55 Gallon Drums) metal barrels for trash disposal, but they also served another purpose..we threw handfuls of 50 and 30 calibre machine gun ammo into them on top of the flammable material, so that when the First Sgt came looking for details someone would light off the trash and the ammo would start going off so that we could exit the back of our tents and avoid the details… That is why we called the street Ack-Ack Avenue… Since our crew lived down at the very end of the street, it was easy to see that we did not pull many of the details that had to be done. The way we felt, they couldn’t expect us to get shot at, keep up with the necessary work after and before flights and pull guard duty at night on our planes” Smeltzer (1999). While stationed at Fenton there seemed to be a lot of activities to keep the 319th Squadron occupied. One activity that seems to have prevailed, even after the departure of the 319th was “cattle rustling” in order to provide the hungry US airmen with an ample supply of beef. Smeltzer (1999) adds that “the weather [was] hot and sticky, near desert conditions, however the fact that it was cattle country did much to make up for it …[and] we ate a lot of beef while [we were] there”. Kangaroo were also often hunted to supply meat when cattle could not be found. All sorts of sporting events were also held at Fenton and these included basketball and baseball, with Volleyball proving one of the more popular sports. Indeed a fascinating reminder of the 319th’s stay at Fenton field is the basket ball court which still exists in the Fenton base Camp area today although time as taken its toll on the ashfelt courts surface. S/Sgt William Simon, Waist Gunner at the basket ball court (Fenton Base Camp). Ray. W. Smeltzer collection (1999). Along with the recreational activities there were also the mundane camp chores to carry out, like doing the laundry and performing regular ablutions. Due to the remote nature of Fenton Field, the performance of these chores was made more difficult and often required more time to perform than normal due to the lack of suitable facilities. Indeed Ray Smeltzer states that they lacked basic washing items such as soap on many occasions. “The laundry facilities at Fenton..[in early 1943] The faster the water boiled the cleaner the clothing got.. at least we thought so..As you can see all the comforts of home, we could even nap a little…” Ray. W. Smeltzer collection (1999). “This gentleman is performing his morning ablutions..seen here he is brushing his teeth. The milk can was filled with water, we got that on a schedule basis, and the was basins were G I steel helmets, which rested in home made racks between 2 trees. Seemed like everything including nature, were against us“. Ray. W. Smeltzer collection (1999). According to Ray, crews from the 319th would also “chip in” and help the ground crews on occasion carry out basic maintenance to the squadrons aircraft or “ships”. Despite this, the bulk of the maintence tasks were carried out by the ground crew and as Ray describes, were invaluable in keeping the B-24’s serviceable. “This photo shows our ground Crew changing engines on Roarin’ Rosie (41-31698) [Rays assigned aircraft], and it sure illustrates the handicaps they labored under in an effort to keep us in the air. They did a magnificent job that should not be overlooked under primitive conditions and working long hard hours. For the most part, Ground Crews were always glad to see the assigned crews flying their bird, and woe and behold the outsider crews who bent their ship… a tongue lashing was the least they could expect.. They were a lot more understanding with us..” Ray. W. Smeltzer collection (1999). Note the camouflage netting strung over the hardstand and the lack of a revetment, many of which were constructed later by number 8 M.W.S. (Mobile Works Squadron) RAAF. Major engine overhauls to the PW 1830-43 engines, which were required after a specified number of flight hours, were carried out in the open on the ground. SDASM Archives – (San Diego Air and Space Museum Archive) – No known copy write restrictions. The workshop area above taken during the 319th’s occupation of Fenton Field illustrates the primitive conditions in which these mechanics had to work. Note the up side down flap and carriage arm attachments from a B-24 in the foreground. A main landing gear leg from a B-24 which has been turned upside down and embedded in concrete in the servicing area at Fenton Field. It is missing the torque arm assemblies but still retains the inner flange. It is speculated that it was positioned in this manner for servicing/fixing the wheel and brake assemblies from B-24 aircraft.